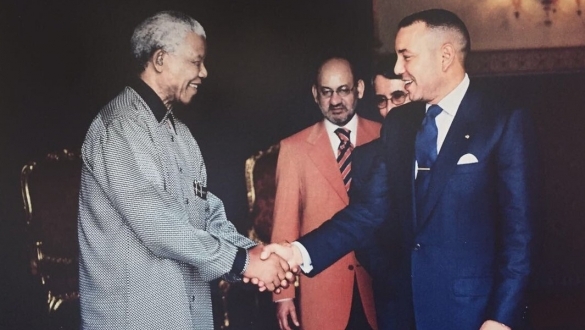 King Mohammed VI has paid tribute to late Nelson Mandela that he described as “a man of natural modesty and humility,” “a universalist who embodied a particular vision of the world”. “This extraordinary man belongs indisputably to a category of universal people whose destiny has local, national, continental and global implications,” said King Mohammed VI in a message read out at the Nelson Mandela Peace Summit, held Monday at the United Nations headquarters in New York, in celebration of the centenary of the birth of the late South-African leader. “An icon of reconciliation, the late Mandela never stopped urging us to engage in a collective self-examination regarding the humanist values he embodied, calling upon us to transcend our divisions, be they political or economic. To grapple with the scourge of racism, he advocated liberation; to tackle partition, he championed unity; to ward off the perils of fragmentation and marginalization, he opted for unification; he was a relentless advocate of progress and prosperity, instead of underdevelopment and isolation,” King Mohammed VI underlined. “The world admires him for his strength of character, his concern for vulnerable people and his fight, throughout his life, against discrimination and inequality”, said the king in his message read out by Foreign Minister Nasser Bourita. “There was most certainly a Moroccan chapter in Madiba’s rich life,” the Monarch said, underscoring the sincere affection and esteem he harbored for the late King Hassan II. “This affection was mutual. It stemmed from the unconditional support provided by Morocco to African Liberation Movements. This was a core feature of the reign of my late grandfather, His Majesty King Mohammed V, and of my late father, His Majesty King Hassan II. Both of them welcomed all African Liberation Movements. When the latter sought help and support, they used the Kingdom as a military and political base”, explained King Mohammed VI. As leader of the African National Congress, Nelson Mandela knew that “he could count on Morocco’s support”, underlined the royal message, reminding the world that between 1960 and 1962, Mandela had lived in Morocco which supported his legitimate struggle. “This multiform, continuous assistance during the struggle waged by the South African national movement included the training of ANC activists in the Oujda region, the provision of logistical and military aid to the ANC as well as support for the diplomatic activities led by the Nelson Mandela Movement abroad”, recalled the Sovereign, saying that Mandela visited the North African Kingdom in November 1994 to show his appreciation and unfailing solidarity with the Moroccan people. During this visit, late King Hassan II awarded Mandela Morocco’s highest distinction in recognition of the exceptional struggle he waged for equality and justice. Mandela incarnated a school of wisdom that “his successors should perpetuate. The values he embodied with unwavering courage are the very values to which we firmly adhere. They are the guiding principles of my country’s political and civic action in the Kingdom, in Africa and in the world”, said King Mohammed VI. Mandela “showed us that dialogue and negotiation must be pursued with relentless resolve, no matter how deep the chasms or misunderstandings”, stressed the Sovereign in his message. On the sidelines of the Nelson Mandela Peace Summit, UN Secretary General Antonio Guterres unveiled a life-sized statue of late President Nelson Mandela at the UN headquarters. The UN General Assembly also honored Nelson Mandela with a pledge to build a just, peaceful and prosperous world and to revive the values for which the former South African President and anti-apartheid campaigner stood. The UN has declared 2019-2028 as the “Nelson Mandela Decade of Peace” and issued a political declaration to promote disarmament. Posted by Jaber Ali on Sep 25 2018. Filed under Headlines, World News. You can follow any responses to this entry through the RSS 2.0. Both comments and pings are currently closed.